The ability for me to watch the live birth of this calf from my office in another part of the building was certainly an example of how 21st Century learning is fully integrated for students and staff alike. Under the direction of our administration and with the support of our Board of Education, our small district has taken the integration of technology very seriously, and in four short years, we have gone from chalkboards to Smartboards, from pencil to netbook, and from worksheets to flipped classrooms. There is technology used in every classroom in every discipline every day. One of the buzzwords in education is the work authentic, and teachers work hard to make connections from the content in class to the real world. The Wamogo High School program with its chapter of the National FFA Organization and Agricultural Education accomplishes both with authentic educational experiences supported with technology. I paid closer attention to the video monitor as the noise from the barn came over the computer’s speaker. I watched as students gathered around the stall, and then saw Lori, the animal science teacher, jump in to calm the cow and rearrange the straw for bedding. Suddenly, three or four students and the culinary arts teacher formed a line behind the cow, and in an unrehearsed routine, began helping Lori with the birth. I took a screen shot. “Pull,”Lori urged, and I saw there was a gentle movement from the line-up behind the cow. I took another screen shot. “Pull”, Lori cried again, and the movement became more obvious. Suddenly there was a jostle, and the gap between the cow and the line of helpers became larger. All eyes were on the calf laying slick and newborn on the hay. I took another screen shot. 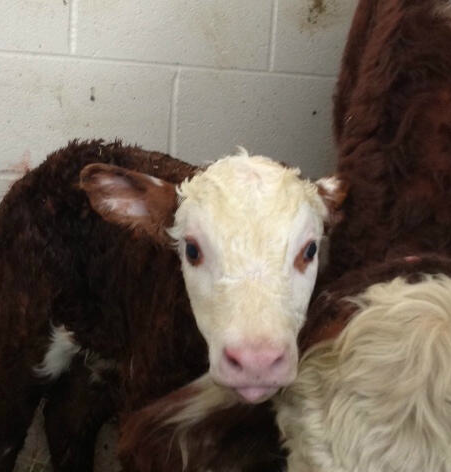 …and the new calf sits in the hay. A few minutes later, there was came a breathless and garbled announcement over the speakers from a student about “… here”; there was no need for clarity. Given our students’ familiarity with texting, everyone knew what had happened anyway. The combination of technology (Ustream, screenshots) in broadcasting and recording the birth of the newest member of the agricultural program with old-fashioned “hands on” physical labor illustrates 21st Century authentic learning. I posted several of the screen shots on Twitter. Almost immediately I was retweeted by UStream; in seconds, Wamogo had gone viral! Cow and calf meeting for the first time. There has been a seamless integration of technology into the vocational agriculture program at my high school. The students who participate in the program are involved in a time honored occupation, an occupation responsible for civilization as humans moved from roles of hunter-gatherers to farmers. They just know how to Tweet, post, email, blog, Instagram, Facebook, Tumblr, or stream a live TV feed to show what they know as well! King Philippe III – he is her 3rd calf and this is a royal names themes year.